“Penguins” spread the thrills and chills on this fascinating documentary feature. Not to be confused with another “March of the Penguins” film or “Happy Feet” sequel. Before Disney concludes the Phase Three of Marvel Cinematic Universe, the company has another studio that keeps the series alive for a decade under their own documentary studio Disneynature. Today, the studio has “Star Wars,” Pixar, Disney Animation, and Marvel. Disney now has 20th Century Fox and its assets. 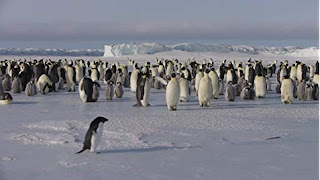 For this upcoming Earth Day, and narrated by actor Ed Helms, “Penguins” will take you through the frosty wilds of Antarctica. In this feature, an Adélie penguin named Steve that is about to embark on his first adult trip to Antarctica. Steve puts himself to the test on performing several tasks: find a good mate, build a suitable nest, raise the chicks, and live long enough for survival and the next seasons. When it comes to documentary films or any ordinary films, every film needs a hero to lead and have something that makes the audience laugh in their seats. Whether or not it’s possible to see what a penguin can do as part of their nature and biology, it is still catches the moment where you feel like you studying the penguin’s behavior. Though, it’s not an experience based on what you see in the movie theater, it’s based on how concern you are when cruel things happen to the world, the animals, and the environment. Director Alastair Fothergill and newcomer Jeff Wilson put all the hardwork and dedicated efforts of crafting this beloved feature like the previous films “Bears” and “Chimpanzee.” Fothergill really dropped down every key notes and formats for “Penguins” for a scientific experience just as Fothergill wanted to make “Penguins” more intensifying like 2006’s Oscar-winning animated feature ‘Happy Feet.” Don’t forget that the main word for this film is anthropomorphism, meaning the attribution of characteristics or behavior of an animal/human, which is a driving-force for Disneynature films. Ed Helms (NBC’s “The Office,” “The Hangover” trilogy) steps in to provide both fact-filled narration and the “voice” of Steve. From the biggest-selected stars like James Earl Jones and Tina Fey, Helms did the job perfectly for the recording the narration. He not only showed comedy, but also he made Steve a strongly penguin, bent for survival. I also enjoyed the scenes with Steve growing up with a love interest of Adeline which played out the classic REO Speedwagon’s “Can’t Fight This Feeling.” Same for the Harry Gregson-Williams' buoyant score, which has been further enlivened by those inspired 1980s song selections. 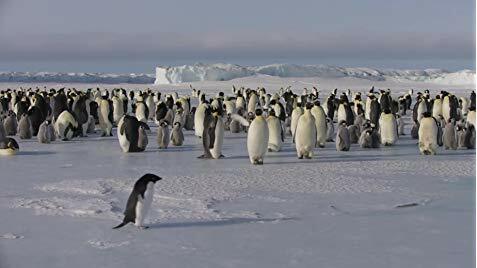 Although, there were paths of peril where I took a hard eye on the hazardous creatures from killer whales to leopard seals and from snowy hurricanes to tornado-like punishing katabatic winds. These were what I noticed that were heavily made the audience shriek with horror as an advantage of G-Rated film.